Okay! Let’s continue the individual episode reviews with episode eight, “Shadows in the Glass.” You know the drill. First there’s the recap (to refresh everyone’s memory of the individual scenes of each episode), followed by my comments on various things, starting with general thoughts and moving into more specific areas. Here’s a skip link to My thoughts, if you don’t need the recap. This post actually marks my 750th since starting this blog. Of course, this has nothing to do with the review, but I’m quite happy to celebrate an anniversary of sorts with an episode I really enjoyed. Moving on! Wilson Fisk wakes up from a bad dream, in cold sweat. He sits up and looks at his newly purchased painting, before getting up and, very methodically, making breakfast. It’s an omelette topped with chopped chives, and if you’re the least bit hungry watching this, you’re going to want one too. Next, Fisk picks ut a suit from his nearly all-black wardrobe and puts on his father’s cufflinks. When he turns around, he catches the mirror image of himself as a boy, sprayed with generous amounts of blood. This episode sure knows how to grab the viewer right from the start. In contrast to Fisk’s pristine penthouse, Matt’s apartment is still a mess. His morning routine looks considerably less appealing, and Matt looks very tired and demoralized by past events. At the office, Karen and Foggy discuss their recent activities and are worried about what Matt would say if he knew. (In the interest of honesty, Foggy also admits he doesn’t like Karen’s coffee.) Matt shows up, catching the end of their conversation, and confronts them. Karen has to admit they’re still investigating Union Allied. Matt is not happy and interrogates the two of them, berating them for putting themselves in danger. He says that they have to stop sneaking around and that they should use the legal system instead, though in doing so he agrees to help. 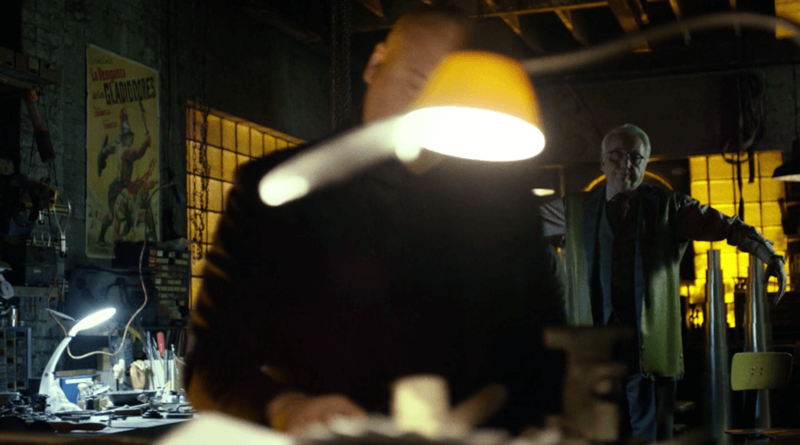 Fisk and Wesley meet with Nobu. Nobu is not happy that Black Sky is dead, and accuses Fisk of not keeping up his end of the bargain. Fisk defends himself by pointing out that he did everything asked of him, that is make sure that there were no police at the docks or along the intended transit route. Next, we flash back to what looks like mid-70s New York. A young Wilson Fisk is helping his dad make signs for his city concil campaign. His mother is worrying about the overdue bills. 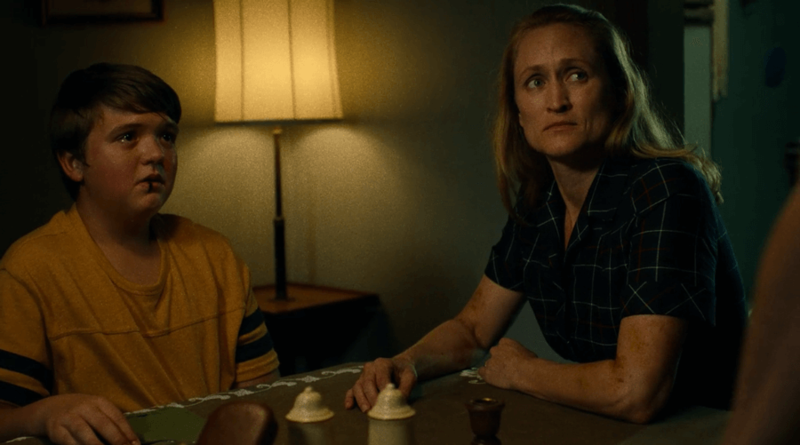 It takes all of two seconds for the viewer to realize that Bill Fisk is the bully of the family, just from how he speaks to his family and young Wilson’s apprehensive behavior around his father. Bill’s big plan is to secure a position on the city council so that some of that money pouring into the pockets of corrupt politicians can be his. In the present day, Fisk is on the phone with Vanessa when Wesley calls to tell him that detective Blake just woke up from his coma. They worry about what he might say, considering he’s probably not too happy that he was shot. They decide they need Blake taken out, but are having logistical issues (only two of the cops guarding Blake’s door at the hospital are “theirs”) and decide to try to reach out to Blake’s partner Hoffman. At Nelson & Murdock, Matt, Foggy and Karen are doing research on the connections of the various suspicious companies we’ve already been acquainted with. Karen then alerts them to the news reported by the Bulletin that Detective Blake has regained consciousness. Matt’s interest is certainly piqued. Meanwhile, Fisk sits down with Hoffman. The latter is reluctant to do what they’re asking since he and Blake are apparently childhood friends. Fisk tells Hoffman that he was not happy that Blake had failed to report that the addresses for the Russian-controlled locations that were bombed had been compromised. With enough pressure applied, Hoffman shows up at the hospital. He gets through security at the door by hiding a syringe in a meatball sandwich. Hoffman apologizes to Blake before emptying the contents of the syringe into his partner’s arm. Blake wakes up, and Matt arrives on the scene through the window (presumably), and grabs Hoffman from behind. He jams the door shut and convinces Blake, who is dying, to give up whatever information he can before it’s too late. When the door is finally breached, Matt has already escaped. We check back in with young Wilson, who is being comforted by his mother with some Zuppa Inglese. Wilson has been in a fight with another boy who had been knocking down Bill’s signs, and he’s got a cut on his lip. Bills tells him to get his coat and they go looking for Bernie, the local bully. They threaten him and Bill beats him up, inviting Wilson to join him and instructs him to kick the man on the ground, over and over, harder and harder. Present-day Fisk wakes up again, and the scene from the beginning of the episode repeats itself, until the phone rings; it’s Wesley informing him that Gao has reached out to him and wants to talk to Fisk. Fisk asks Wesley to be there before she arrives. Next, Fisk pours tea for Madame Gao, who now switches to English and suggests that Fisk is also able to speak her language. Wilson answers in Mandarin and Wesley looks exasperated (as he should!). Fisk, when prompted, also admits that he speaks Japanese. They talk about Nobu, and Gao mentions that Leland is also displeased. Gao has harsh words for Fisk, accusing him of being sloppy and emotional. Gao leaves, after threatening to deal directly with the others if Fisk doesn’t get his house in order. After she leaves, he tips the table over in rage, and screams at Wesley to get out. On our next visit to Wilson’s childhood, we see Bill Fisk force his son to think about what kind of man he wants to be while staring into the wall, uncannily and not coincidentally similar to the painting his adult self bought from Vanessa. Bill says he has to go take care of something, and his wife Marlene is immediately on his case about the money he owes to Rigoletto. When she confronts him, he beats her to a pulp with his belt while Wilson listens. Back in the present, Wesley arrives to tell Wilson that he called for Vanessa, who enters. Fisk asks her to leave, but she stays, asking him what’s on his mind. He admits that he’s afraid of how she would look at him if she knew. With this, we cut back to the domestic abuse in the past. We see young Wilson get off his chair, and grab a hammer. When he asks his father to stop, Bill laughs it off and turns back around. Wilson then hits him in the back of the head and doesn’t stop until his father is dead and he is covered in blood. 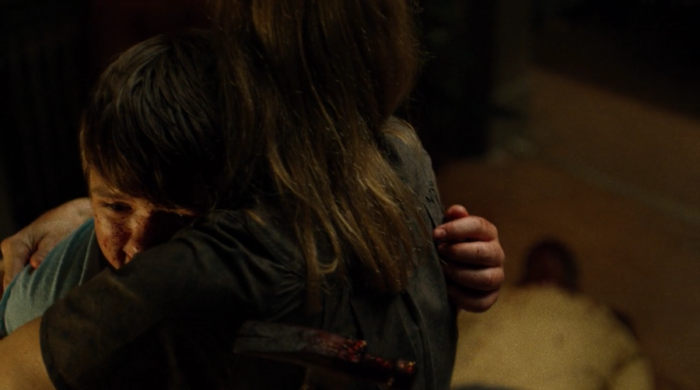 His mother comforts him and instructs him to get the saw so that they can get rid of the body. Very creepy stuff. Grown-up Wilson continues the story about how he and his mother carried their father, one piece at a time, in bags down to the river, every day for a week. Since everyone knew Bill owed money to Rigoletto, no one got suspicious when he simply disappeared. Later, Wilson was sent to live with relatives. Next, Fisk shares his present woes, about the people looking to bring him down, and Vanessa encourages him to stand his ground. Ben Urich is walking in the rain back to his car, talking to his boss Ellison on the phone about some story Ben doesn’t want to do. When he bends down for his keys, Matt in the mask shows up and announces that they need to talk. Matt says that he wants to expose the man responsible for everything going on, and gives Ben the names Wilson Fisk, and Leland Owlsley. Matt talks about Blake and Hoffman, and how he got the information. Ben is skeptical of the lack of real sources and corroborating evidence but asks Matt to tell him everything he knows. Next time Wilson Fisk wakes up, Vanessa is next to him in bed. This morning, he cooks for two. The scene is set to sound of Ben’s voice narrating the story he is working on, about Wilson Fisk – the man who lives in the shadows, taking more than he deserves. Vanessa further injects herself into Wilson’s life by picking out a different suit (medium gray as opposed to black) and another pair of cufflinks for him. We cut to Ben writing his story, but realize it’s all in vain when Fisk goes public on TV. Okay, first thing: I want Wilson Fisk’s apartment. It’s a bit on the sterile side, but man, what a view! And the walk-in closet is great too. I have to give serious props to the set designers here. 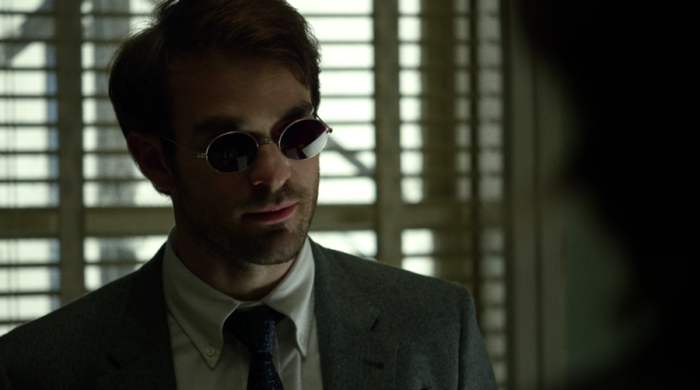 Everything around Fisk is one reason this is one of the best-looking episodes in an overall fantastic-looking TV show. The next scene gives us a short glimpse of Matt’s morning routine in his busted up apartment. It’s hard to not see many of the contrasts and parallels between the two men throughout this episode (including childhood alcohol consumption!). They are both at a low point, Fisk’s plans continue to unravel during the course of the episode, while Matt is dealing with his recent encounter with Stick and his masked alter ego still being the prime suspect in some pretty heinous crimes. Matt takes his lousy mood with him to the office, where he’s not happy to learn about Karen and Foggy’s most recent shenanigans. I’m actually a little surprised to see Foggy, in particular, being so receptive to Matt assuming a leadership position in this situation. He talks to them like a parent. I can certainly see Matt’s position. He’s been badly burned in the last two episodes so when he says he wants to take the legal route, you almost believe him. Still, Foggy and Karen wouldn’t know where he’s coming from. This is also the episode where Vanessa really takes the plunge and fully accepts Fisk and his world. Her very real compassion for Wilson is clearly communicated and the way her being in his life changes it, is incredibly well done. She gets him into a different suit, and picks out new cufflinks for him to mark the next step on his journey. He is no longer alone, and that’s bound to change him. When I first learned how big a part of this series Wilson Fisk would be, my reaction was lukewarm. I had nothing against Fisk, per se, but I was worried the main character would be toned down too much. 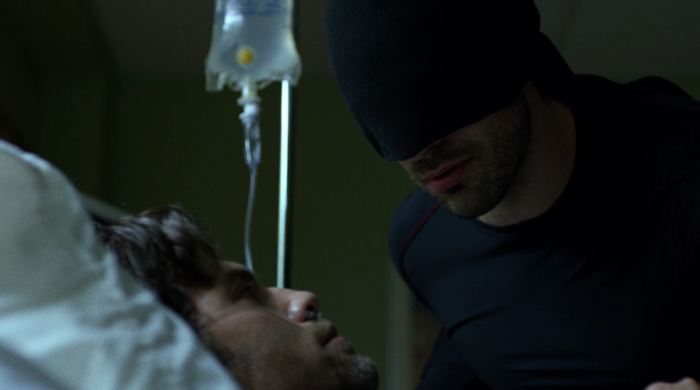 Not only has that turned out not to be the case, this show has really made me invested in Fisk’s story. 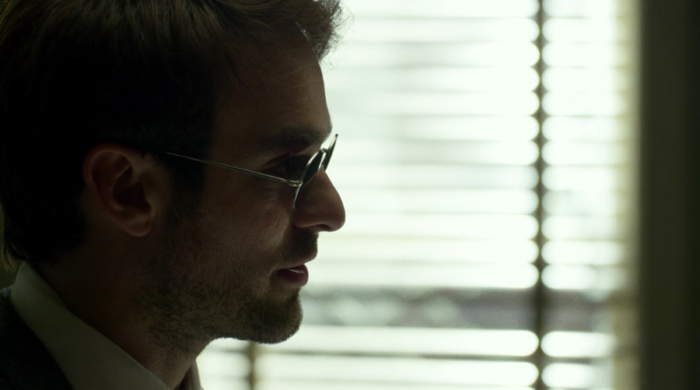 This is easily one of my favorite episodes of the entire show, and a lot of it rides not only on the better than average esthetics and pacing, but on the flashback scenes to the life of young Wilson Fisk. They are nothing short of amazing, and it’s impossible not to care about this child who got dealt a rough hand. At least he had a decent mother who cared for him, and, well, helped him dispose of his father’s dead body. “Get the saw” is one of the most chilling lines of the entire series, in my mind. The end of the episode is also incredibly strong. When Wilson Fisk is at his weakest, he decides to raise the stakes and go public, pitting himself against crime and corruption, aiming to become a beacon of light for his community. If Matt started this episode at an all time low, that’s nothing compared to how he ends it. Nothing to report this episode, since there’s not really that much for Matt to do. There’s also a closer look at the braille display that connects to Matt’s computer. It’s apparently a 24 cell VarioConnect (kudos to @kevstanley66 on Twitter for catching that). 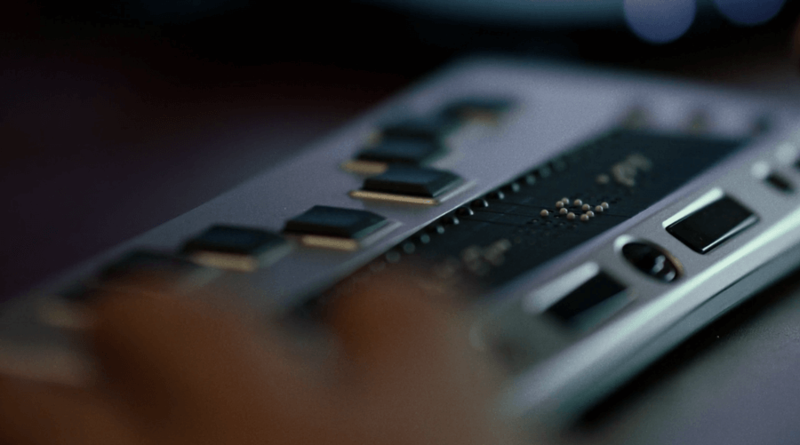 While we’re on the topic, I have to say that I always figured that Matt would be the type who prefers a braille display compared to using just a screen reader – which is more common – for the simple reason that he wouldn’t want to burden his ears more than necessary, and likes to stay alert. This is clearly the better way to do office work while leaving his ears unoccupied to listen for criminal activity. There were a few Easter eggs this issue. The most obvious one is the look inside Melvin Potter’s workshop which features both a gladiator poster on the wall and what looks like Stilt-Man’s legs in the background. While getting fitted for his suit (green! ), Owlsley also talks about his son “Lee,” which may be short for Leland. This has led some to speculate that this Owlsley is not meant to be the Owl, but his father. There’s also a lot of talk of Rigoletto, the crime boss we heard about in episodes one and three. Here, he’s the one Bill Fisk borrows money from to fund his political campaign. Rigoletto was the Kingpin’s predecessor in The Man Without Fear as well. Wilson Fisk! 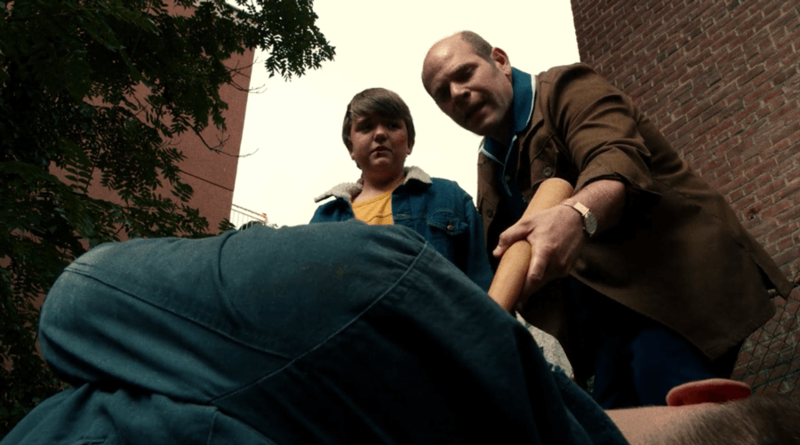 This is Wilson’s episode and not only is Vincent D’Onofrio absolutely amazing, the child actor who plays young Wilson, Cole Jensen, is one of the best I’ve ever seen. I want to hug him, and tell him everything is going to be okay. Which wouldn’t be the truth, but oh well. I like that Wilson Fisk showed no obvious psychopathic tendencies as a child. If he had grown up in another family, things would have turned out very differently for him. My favorite was Nelson v. Murdock too!! Me three (for Nelson vs. Murdock)! While I found this episode interesting, it isn’t one that I need repeated viewings of like I did with NvM. Yet another vote for Nelson v Murdock as a favorite, but this one was very powerful and gave the viewer a ton of insight into Wilson Fisk. He’s not a sociopath, he’s what happens when a boy is raised by bullies and people with little or no regard for the law. Wilson is a functional version of his father, more intelligent and insightful but still capable of deadly rage, even from a young age. He is also, unlike a true sociopath, still capable of deep feelings and love for another human being. I mentally went back and forth between whether Wesley didn’t know Fisk knew those languages, or knew but it was a secret between them. Since they were such good friends, I ended up going with the idea that he knew. I took Wesley’s expression as sort of “Why the **** are you admitting to her after all this trouble we go through?” not a “Seriously, you speak Chinese?”. Both young Matt and young Fisk deserve serious props for their performances. Either one could have sunk their respective episodes had they not gotten the performance right. Cole Jensen knocked it outta the park. This is the episode where I thought Owlsley starts to become a little too over the top defiant with his reactions. This is a minor quibble, but several times from here on out until the end I kept saying to myself “Do you really wanna keep antagonizing this guy who completely loses control and decapitates people?” Maybe it was meant to show that Owlsley wasn’t as smart was he thought he was. Visually, this is a bold and compelling episode, maybe the best of the series. Reminded me of the daring we saw in Breaking Bad. And yah, young actor playing Wilson Fisk delivers a remarkable performance. The talking alarm clock is really nasty looking. I loved that detail and wonder what the thoughts behind that was. Did the prop people just buy a used one and decide to keep it the way they found it or did they buy a new one and make it look more worn? A great episode, with the right pathos in the “construction” of Fisk character. It is maybe the episode in which I feel more ambiguity and moral blur and I like it. 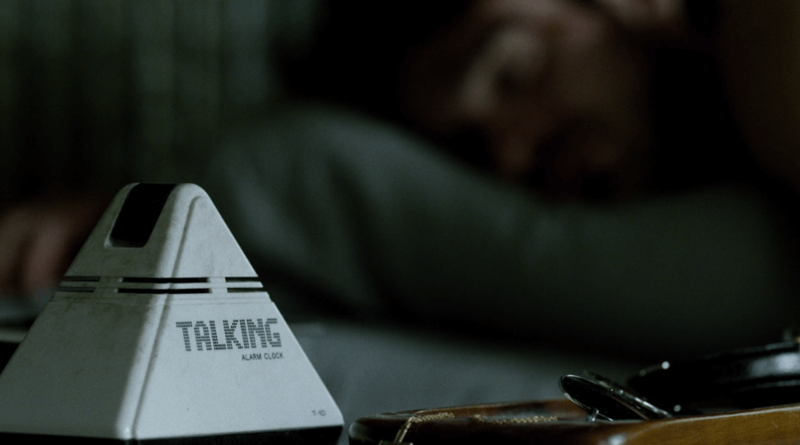 As for the talking clock, I don’t remember it on the bedside table in the first episode … am I missing something? Foggy’s phonecall on his cell woke him that episode, so I don’t think the camera focused on the rest of his side table. @Elizabeth: I’ve been finally able to rewatch that part and there is a good close-up of the side table but no talking clock; actually there is something that could be an old clock?